At Flowrite Drainage we offer more than just block drain relief. There are many minor and major issues that can appear within internal and external drains and we have the means to resolve all of them. With wear and tear it is possible for a drain to collapse or a mass root intrusion can penetrate the drain causing damage. At this stage an excavation may be the best and only solution to get the drain flowing again. This involves excavating and removing the defected section of the pipe work and replacing it normally with a new section of plastic pipe. As a customer of Flowrite Drainage you can rest assured that the area to be excavated will be scanned for any live services prior to digging and the surface relayed to its existing state. We guarantee that the job will be done promptly, safely and the greatest of care with the least disruption to your business or home. As trees and bushes grow they have the ability to penetrate and damage drains causing blockages. 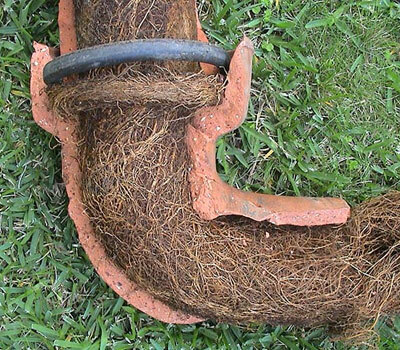 We offer a root removal service to deal with the root intrusion and clear the drain. 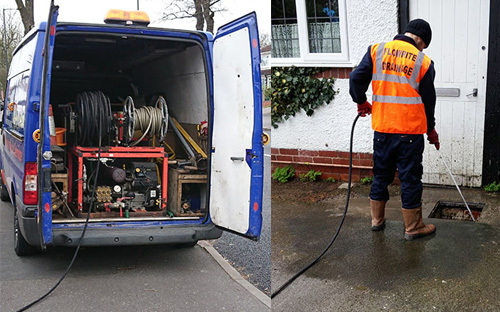 A professional root removal requires a drain CCTV survey to locate the roots and a high-pressure water jetter fitted with a specialist cutting blade to cut through the thickest of roots. Once the roots have been removed the section of the pipe can be patch lined to seal the joint and stop any further ingress into the drain. 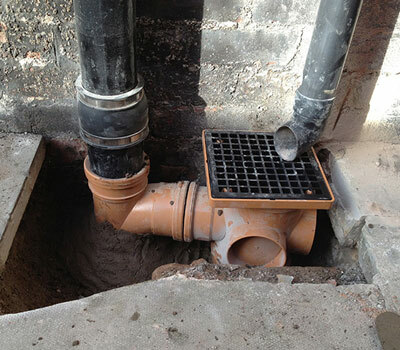 Drain relining is a cost effective way of repairing a when excavation is not possible. If relining is required we will do a full survey to decide with a No-Dig relining or a Patch Lining is necessary. 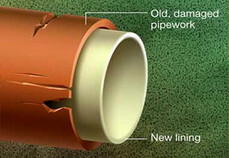 No-Dig relining – Known as CIPP (Cure-in-place pipe) is a technique that involves inserting a line impregnated with a resin into the drain. The liner is then inflated with air pressure which then bonds to the original pipe and in an hour or two the resin cures and hardens. The insert is then removed creating a new pipe within the original pipe restoring the integrity of the drain. We can line drains from 100mm to 225mm in size. Patch Lining – Patch liners are the perfect solution for localised open joints, root ingress, displaced joints, cracks, fractures and small holes in the drain. The liner is impregnated with a special resin, then wrapped around in inflatable packer and inserted to the defected area and allowed to cure. the packer is then removed leaving a seal over the defected area. Patch lining is a quick and cost-effective way to repair small troublesome areas which when untreated can cause some major problems. High pressure water jetting is a extremely effective way of clearing blocked drains. It is used to unblock de-scale and for the removal of root ingress in the drains. Our fully trained engineers will carry out the work from our up to date van mounted units.